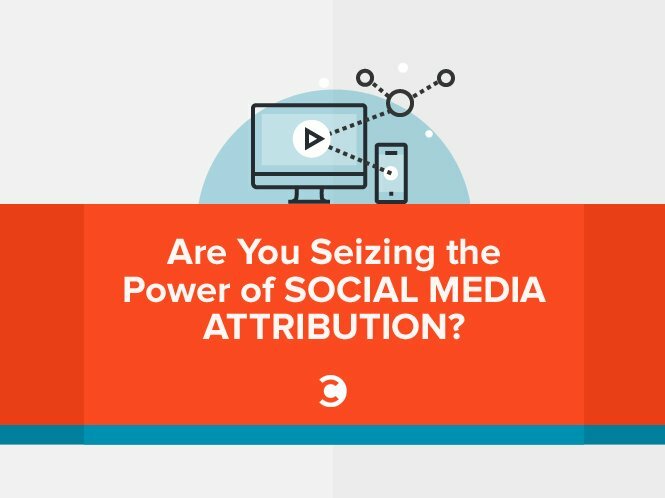 So let’s assume a prospect clicks on my tweet, gets to your blog post, and reads about social media attribution. They want to get more information, so they will go to Google, search my name, the company name Oktopost, get to my website, and hopefully leave their information or fill out a form to get a demo, a whitepaper, webinar, or whatever. They left their information. Now, whatever tracking method I’m using—if this is Google Analytics, a marketing automation platform, like Act-On, SalesFusion, Marketo, Eloqua, all those technologies—it is going to tell me as the marketer that this lead came from a Google search. But in reality, it came from a tweet that triggered somebody to do a search and led them to my website. With most of the tracking technologies, you’re going to miss that connection between social and the lead generated. This is lead attribution. And you’re actually going to give incorrect attribution. You’re going to give the attribution to a Google search when, in fact, it was actually a tweet. So in many cases, especially when we’re curating content and sending traffic from our social media assets to third-party websites, we’re missing a lot of this data. Even if social is helping to generate leads and is getting you traffic—but through third-party websites—it’s very hard to track. You might be getting useful traffic from social, but you won’t know. You will be clueless about it because you’re not tracking it in a way that you can easily see that association or attribution. Barry: So the complexity of a buyer journey contributes to the ambiguity of figuring out how that person got there. A large part of it, I guess, is identifying the channels that are actually working. So if that channel happens to be Twitter or your blog or Facebook, they’re not getting their fair shake when you look at the numbers. Daniel: Yeah, I think when you say what’s working, to me that triggers what content is resonating with my audience. What are they reading? What are they clicking on? What’s triggering them to move further along in a marketing funnel? In almost every single discipline that we do in marketing, we measure everything. We have platforms to see heat maps on our website—to see where the mouse is moving over, to see which buttons are getting clicked. We A/B test every single web form. We A/B test email subject lines. But, if you think about, when it comes to social media, nobody is testing, they’re just putting their content out there, and what happens, happens. And then you might get the more advanced marketers that say, okay, so I’m getting 90 percent of my social traffic from Twitter, five percent from LinkedIn, whatever percentage from Facebook—that’s very generic. They’re not saying, listen, if I write my tweets with an exclamation point or with a smiley or with a certain emoticon, that’s going to get me more clicks per impression and drive more traffic to my website. So just like we test a webpage, just like we test conversion forms and email opens and email clicks, we should be testing our content on social as well because, after all, social is content, just like website content, just like email content. Barry: So how is it done? You’ve brought up marketing automation platforms and went through a short list. You can use Oktopost for a lot of things, but you need to plug marketing automation in with Oktopost to do this enterprise level B2B social media attribution task we’re talking about, don’t you? Daniel: Yeah. It really depends on the company, but I believe that there should be one platform that you’re going to use to measure the bulk of your funnel, the marketing and sales funnel, or the pipeline. This could be in your market automation, like with Marketo, or in maybe sales for CRM. Larger companies might have a BI platform where they extract data from CRM or marketing automation and put them in dashboards. In order to get full attribution, you need to have full data connectivity between these platforms. Social data needs to flow into your marketing automation. Marketing automation needs to flow into CRM, because that’s where the sales are happening. There has to be a connection. You can’t expect to be able to attribute social media to lead generation efforts if the data isn’t flowing between those two systems. Barry: What about knowing how your social media activities contribute to sales enablement, lead scoring, lead nurturing, and the ability to develop content that’s more in line with your marketing goals? Daniel: There are many, many use cases. One of the main things that we do in marketing automation is if our prospects are looking at specific pages on the website, then we can learn what they’re interested in, especially if they’re visiting the pricing page. Further down the funnel, they’re interested maybe in purchasing. If they’re looking at a specific topic, they are interested in that. So if we have the social data, when somebody clicks on a tweet, yeah that’s great, we can say we got traffic from Twitter, but as the author of that tweet we know an awful lot about what’s happening in that message. We know why we sent the tweet. Did it come from a specific campaign? What’s the topic of the tweet? Was this tweet leading to a whitepaper that discusses ROI, or was the tweet leading to a white paper that discusses financial security platforms? So if we know everything about that tweet, why it was written, where it was published, who published it, that information is now inside the marketing automation, and we can actually understand the interests of our leads and prospects by looking at their social click activity. Then we can use that information to nurture them in a much smarter way. Another example: Let’s say we have a prospect that is in the sales pipeline—what we call an “open opportunity.” Let’s say in Salesforce CRM. So the sales rep is working on the prospect, and let’s say it’s a long sale cycle, an enterprise sale, and this prospect is constantly clicking on the company’s social content, a tweet that went to Wall Street Journal, a LinkedIn update that went to somebody’s online blog. All of that information—once fed into marketing automation—can trigger alerts to the sales rep that his active prospect is looking at social content, and then actually show the rep what content he is looking at. So when the next conversion or the next follow-up takes place with this prospect, it can be based on what he has been doing on social media. As an example, to bring it down to earth, when I call you up as a prospect, I say, “Hey, Barry I see you took interest in the Wall Street Journal article that discussed financial security. Was there anything you need more information about?” And I can learn this just by looking at your social activity. Again, this is the power of connecting social data to marketing automation. Barry: In a very broad sense, we’re talking about the continued evolution of data-driven marketing. The more you know, the better you’re able to provide your customers the experience they’re looking for and move them closer to becoming a customer. Daniel: One of the big trends in marketing automation is real-time personalization. So when you go to a company’s website, you’re shown dynamic content that was created for you. And, again, using social data, you have information that can then be used on the homepage. So when you visit the homepage, you’ll get specific content related to what you’ve been viewing on social media. It’s almost like retargeting on your own website. Barry: Interesting analogy. Boy,ts-watches it just keeps getting more interesting and the tools keep getting more powerful. Daniel: What we love to say here Oktopost is, “You can’t improve what you can’t measure.” So if you want to improve the way you’re doing social as a B2B marketer, as a corporate marketer, it has to be something that’s measurable.